There, staring out at me from the front cover of The Times newspaper’s glossy weekend supplement, is the fashion designer Vivienne Westwood, inventor (together with her then husband Malcolm McLaren) of 1970s punk fashion. What has really caught my eye is the design of the t-shirt she is modeling. The style I recognise as that of William Hogarth, although I have to think for a few minutes before realising it is a detail of The Laughing Audience, a ticket the artist issued to subscribers of his Southwark Fair engraving of 1734. 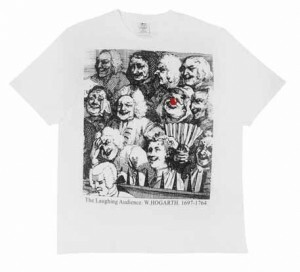 The t-shirt is one of a range Westwood has created to be sold to raise money for this year’s Red Nose Day and colour has been incorporated to Hogarth’s black and white characters by adding a red nose to a chuckling woman. Amongst his unusually varied body of work Hogarth amused himself by producing a number of such studies, of which The Laughing Audience is one of the finest examples. The subject combined both his interest in the human face and theatre. We see the front rows of the stalls, the spectators clearly enjoying a hilarious comedy on the stage, unseen by us. In front of them, three musicians concentrate on their duties in the orchestra pit. Above them in a box sit two fops, who take no interest in the on-stage action as they flirt with pretty orange-sellers, the 17th and 18th century equivalent of ice-cream ladies. The Laughing Audience was later joined by another Hogarth facial study, Scholars At A Lecture, in which students are bored by a discourse being given by the real-life Professor William Fisher of Jesus College, Oxford. If he were alive today I suspect the venerable artist would approve of this use of his picture on a mass-produced t-shirt. He spent much of his career finding ways to promote his work, hugely confident in his abilities and piqued whenever a rival was held in higher esteem. He would certainly note with delight that it his, rather than the works of contemporaries such as that damned William Kent or the young upstart Joshua Reynolds, that remain so popular almost two hundred and fifty years after his death. Hogarth would probably consider it valuable publicity that his picture is seen so widely by the public. After all, when The Laughing Audience appeared he had already donated vast canvases to decorate the great stairs of St.Bartholomew’s Hospital in order to draw attention to his history paintings (and to prove he was the equal to any foreign artist). A couple of years later he once again took the opportunity for self-promotion by donating further works to the new Foundling Hospital, thus initiating Britain’s first ‘public’ art gallery. We are today blessed that all these works remain in place*. Hogarth was a combination of philanthropist and shrewd businessman so the sale of a t-shirt for Red Nose Day would appeal to both his sense of commerce and charity. But let’s hope Ms.Westwood has obtained permission to use Mr.Hogarth’s picture. There was little that riled him more than the counterfeiting of his work, as was common practice by London’s print-sellers in the early 18th century. At the time he produced The Laughing Audience Hogarth and a group of his fellow engravers such as George Vertue and John Pine were successfully lobbying the government to pass the Engravers’ Copyright Act that would finally give them protection. Three years earlier he had seen the printers make a killing by selling cheap unauthorised copies of his popular The Harlot’s Progress series of prints and he delayed the publication of his follow-up – The Rake’s Progress – until after the Parliamentary Bill was safely passed. Nevertheless the pirates still managed to profit by sending spies to Hogarth’s home-studio at Leicester Square, where he displayed his original oil-paintings from which he produced the prints. Counterfeits were quickly engraved from memory, even stealing the name of Hogarth’s main subject and forcing him to change the character from Ramble Gripe to Tom Rakewell. If you have never witnessed the splendour of The Rake’s Progress I urge you to do so by viewing those original paintings at the John Soane Museum at Lincoln’s Inn Fields. As with Westwood and McLaren’s punks Hogarth was at the same time both a rebel and yet part of a clique. His comrades were many of the London-based artists who socialised at Old Slaughter’s coffee-house in St.Martin’s Lane. It was to improve their skills that he helped to establish the nearby art academy, using equipment he inherited from his late, esteemed father-in-law, Sir James Thornhill. It remained as the country’s leading school of art for thirty years. Hogarth insisted the constitution was democratic but its eventual undoing was that he would not allow those with views that differed from his own to have their say. It led to a rift. Those on the other side of the divide, such as Reynolds, went on to form a rather different kind of academy, which evolved over several years to become the Royal Academy. Decades earlier Hogarth had already been on one side of a divided art scene. The opposition consisted of those who held the view that the only good art came from Italy and France. 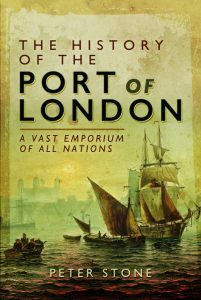 Many of that faction were the wealthy cognoscenti who had made the Grand Tour to the Continent. Enemy Number One for Hogarth was designer and artist William Kent, protégé of the wealthy and influential Earl of Burlington. Hogarth mocked Kent and the opera-loving dilettanti in print in his Masquerades and Operas. Perhaps he later regretted his visual outburst when Kent used his influence to block Hogarth from royal patronage. Despite his apparent rebelliousness he seemed to crave respectability and the hope of lucrative portrait commissions from wealthy aristocrats, although Hogarth would almost certainly have denied it. Yet even without the problems with William Kent he lacked the suave diplomacy of his younger contemporary Allan Ramsay to survive at the royal court. Hogarth produced some fine portraits but they were of merchants, professionals and gentry, including the splendid one of Captain Thomas Coram for the Foundling Hospital, rather than dukes and duchesses. He made another unsuccessful attempt to ingratiate himself with royalty in 1746. His March To Finchley – perhaps my favourite of all Hogarth paintings, also at the Foundling Hospital Museum – depicted a chaotic scene on the Tottenham Court Road as bands of London militia assemble to march northwards to defend the capital from the Jacobite army of Bonny Prince Charlie the previous year. Wrongly calculating that such loyal subject matter – the Pretender’s rebellion had come to nothing and the Hanoverian throne remained safe – Hogarth sent the painting around to the palace with the proposal of dedicating it to His Majesty. On seeing it King George was horrified by the depiction of his troops getting inebriated outside a whorehouse and is reputed to have remarked in his heavy German accent: “What? A bainter burlesque a soldier? Take this trumpery out of my house”. Royalty and aristocracy wanted portraits, not anti-establishment satire, and therefore Hogarth’s failure to attract commissions from the highest levels of society ensured that he continued to produce such a wonderfully diverse output, much of which can amuse us today, as it did his own audience of the 18th century. Three centuries on and his references to contemporary politics, theatre and literature are lost on anyone today without a comprehensive knowledge of Georgian Britain. Yet many of Hogarth’s ‘modern moral subjects’ remain as relevant today as they were then: The Harlot’s Progress (a pretty young woman arrives in London but is drawn into a life of prostitution); The Rake’s Progress (a young man inherits a fortune but flitters it away); Marriage à la Mode (arranged marriage ending in disaster); Industry & Idleness (wealth from hard work, or poverty from laziness); Gin Lane (addiction); and An Election (corruption in politics) are merely the highlights amongst many. * St.Bartholomew’s Hospital at Smithfield and the Foundling Hospital Museum at Bloomsbury.